Courage. This is what Kristin from Peace, Love and Muesli reminded me I need to have while Giovanna is teething and mostly not sleeping at night. Since I cannot nap during the day (when Gigi usually crashes out), I am seriously exhausted. At my wit’s end. Just ask my husband. How am I supposed to be a productive member of society? How am I supposed to build my business and write and blog and exercise and clean my house and cook dinner and do laundry? Most importantly, how can I lovingly care for my daughter when I am too tired to play? The answer is caffeine. And, of course, courage. I started taking many deep breaths. Inhaling courage and exhaling the knot in my throat that twists and tangles my mood. I am sipping my green tea and pondering the following words about courage and doing everything I possibly can to keep my baby happy. Even if I’m not a perfect mother or entrepreneur or friend or writer or whatever. I am giving myself a break and newly appreciating exactly where I am at this moment. This blogging hobby is great therapy. I am convinced teething is worse for the parents than the kids. I have no memories of cutting teeth but I will never forget the misery of Clarabel cutting 8 teeth in 5 weeks. Courage is good. Ignoring the extra house cleaning and just doing the survival basics works too. And calling your mom to come and visit. Good luck to you. My babe was just sick for the first time ever and it was horrible. She still hasn’t cut a tooth, (she’s seven and half months) so I’m sure I will be in your sleepless boat all too soon. Hang in there! Courage is really something.. and all the best with the teething..
Great words of wisdom. 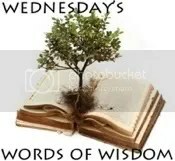 Hopefully you can link up next week on my thoughtful wednesday for other people to stop by and learn some wisdom. courage and caffeine – there’s nothing like it. and ava never napped and the only reason she slept at night was because we co-slept until here recently. but i never got any sleep because she’d make it her missions to kick me and wake me up to nurse every five minutes. it has hasn’t been until the past two or three weeks that she’s been sleeping through the night in her crib. still won’t nap, AT ALL, but i’ll take it. your day is coming lucy – hang in there!!! If I hadn’t let mine cry it out, they’d never have slept. Never. And I’d have been admitted to a mental hospital! LOL! Beautiful post! Nya is teething as well right now. Some days and nights are better than others. On the worst days, I choose to remember that this phase will soon past, that sleep will come, eventually. I love that you say it takes courage to brave through this time. Very true. What a great post! Motherhood has called on my reserves of courage like no other challenge I’ve met. You show a great deal of courage here in being willing to let go that image of yourself as a perfect mother (businesswoman, etc.) And I really believe that small, random acts of courage get us through our days. Yes, been there, I have so been there. This too shall pass and you will once again feel energy. Isn’t teething the worst thing babies can do? It’s so annoying, it hurts both baby & mommy in a pretty physical way. Because sleep deprivation is a form of torture, as we all know. The good news? It’s very temporary. so what I needed today..! for some reason my status update on you says you haven’t posted in 3 months. I was like……WHAT !!! Let us resolve to walk through the rest of this day with courage and receive the strength that comes from Him….that is my hope for myself today….and for all of you…..